I love making cards for my family, friends and charity. I also love to make flowers. 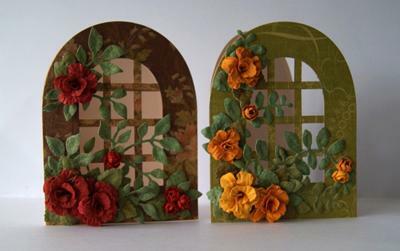 The Roses I made using Spellbinders Rose Creation die and big daisy using Spellbinders Daisy Heads die. 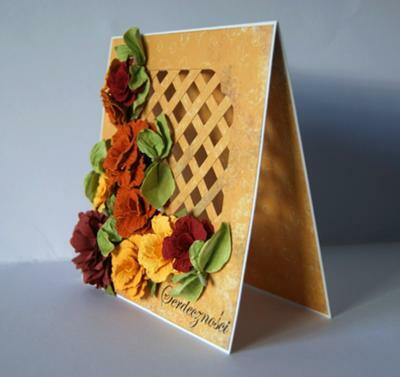 I used orange pattern paper by UHK Gallery and white card stock for the base of the card. It took me two evenings to make the card. One evening to create the base for the card and another to make some flowers. Size of the card 6 in by 6 in. I am always so pleased when ever I see this card made up. It is one of those that always looks really expensive and is sure to get the comments. It looks harder than it is and is well worth the effort to make it. 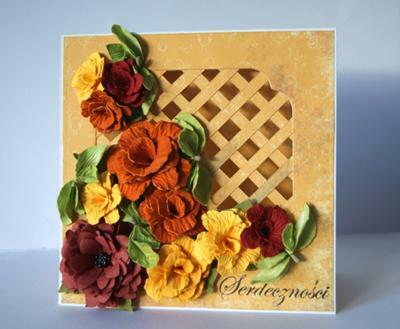 A little patience and preparation and you can make the card as beautiful as this one . 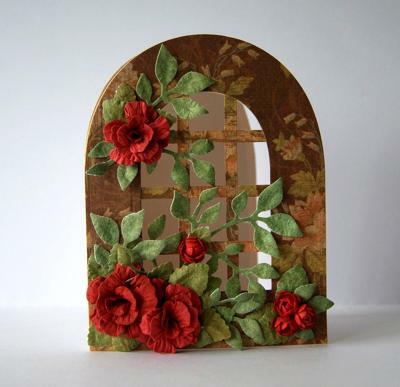 I love the roses and I love Spellbinders dies as the shapes and borders they create are just wonderful and there is so much that can be done with them. But I don't have these flower dies so I guess I will just have to make more room in my collection for both of these. This time I used sizzix 657568 die to create door shape cards. I hand made roses using Spellbinders Rose Creation die and the little ones using retro flower punch. The branches I die cut with sizzix 656064 die. I took me one evening to create cards. Size of the cards 3 5/8" x 4 3/4". I made them for charity to help raise money for a little girl. Oh! 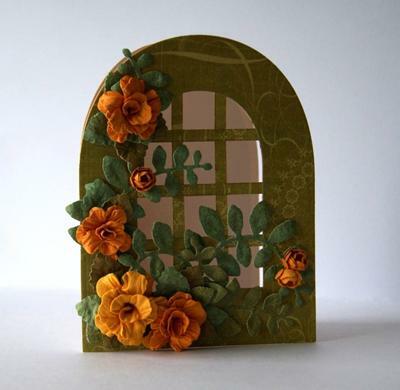 how I love your Trellis Cards... they are amazing and the flowers on them are fabulous. And to make them for a charity is well worth the effort. The video for this card has been such a success and it makes me really happy to think that others find it as good a card to make as I did. You will find this and lots of other Video Tutorials in the NavBar to your left. They will give you some ideas for cards that are truly stunning and are sure to "Wow" the recipient that is fortunate enough to recieve one of your cards.